There are several REINDL families living in the United States today. The name is common in many places in Germany. 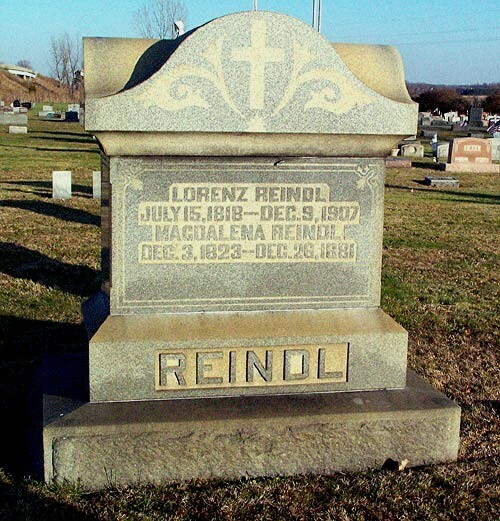 Lorenz Reindl is the earliest ancestor of the Reindl's that settled in north central Ohio. Family verbal history suggests that Lorenz Reindl left Germany when he was 18 to avoid military service. This would have been about 1935/1836. Per the 1900 U.S. Census, Lorenz stated that he immigrated to the U.S. in 1835. Per the Encyclopedia of Military History, there were no specific international conflicts in Germany in 1836. The Austrian Empire was still developing to the south after the collapse of the Holy Roman Empire in 1806, France had re-established the monarchy in 1830 but was unstable, and Prussia to the east was getting stronger. The area between these developing powers was often referred to as the Rhine Confederation. There was general unrest among various fiefdoms in the southern and eastern areas that eventually developed into widespread conflicts in the late 1840s. Lorenz presumably entered the U.S. via New York, though family lore suggests that he may have been a stowaway. After Lorenz was in the U.S. for a few years, he sent for Magdalena Eisley. They were subsequently married in the United States. Lorenz and Magdalena married about 1854 and started a family in 1855. Their children are listed in the chart below. Lorenz Reindl was a wagon maker by trade, however, he listed his occupation as "blacksmith" in the 1900 U.S.Census. In 1919, Lorenz Reindl's grandson, Charles William Reindl, who married Henrietta Veronica Sutter, started his own Blacksmith business in Mansfield, Ohio. Eventually, the business evolved into working on motor vehicles. Today the business is known as Reindl Spring Service. Lorenz Reindl Family Descendant Book (1818 - Present) - a privatized (dates & places of living people omitted) 6 Generation Descendant Book (PDF), starting with Lorenz Reindl - 10 pages plus index. Click on the following link to view information on the Sutter family. Sutter Family - The descendants of Karl and Katharina Suter.